​Skål International cares about young professionals and students in tourism. In 1999, Young Skål was set up with the aim of creating a greater awareness of Skål International by those young people studying for or training in the various sectors of the travel and tourism industry, enabling them to join Skål. Many Clubs provide scholarships for students in tourism. Young people are bringing to Skål their innovative power and they will benefit from the experience of the active members who may become prospective employers. In the hard competitive world, as Skål embraces all sectors of the tourism industry, it can act as an oasis free of competition, where they can find protection and support and they might even meet their mentors! Young Skål is a special membership category for tourism students or young professionals in the travel and tourism industry. Those young persons who qualify for Active membership cannot be approved as Young Skål members purely on the grounds of age. They must have been a student or young professional in one of the classifications described in Article I section 1.2. of the Skål Bylaws for at least one year. (a) Young Skål Student is a student at an authorised, tourism, educational establishment which grants a degree or recognised diploma upon completion of studies. They must be a minimum of 18 and a maximum of 27 years of age. (b) Young Skål Professional is a young professional training for or working in the industry. They must be a minimum of 20 and a maximum of 29 years of age. (c) Young Skål Associate is a Young Skål Professional still training for or working in the industry after the age of 29 who does not yet qualify for Active membership may continue as Young Skål Associate member until the age of 35. To develop friendship and common purpose between the students of the educational establishment, by participating in areas related to the tourism industry, but also in cultural, sports, travel and public relations activities. To encourage and assist in the tourism education or experience of the members by participating in Skål activities and meeting Skål members. To cooperate voluntarily in all Skål activities and the organisation set up by the sponsoring Club. To promote training opportunities for its members and to acquire professional experience with the support of the local Skål Club. To ensure that its members are fully aware of Skål, locally, nationally and internationally. Young Skål members are members of the local Club and dues are collected in the normal way. Young Skål should be represented on the board of the local Skål Club as observers. 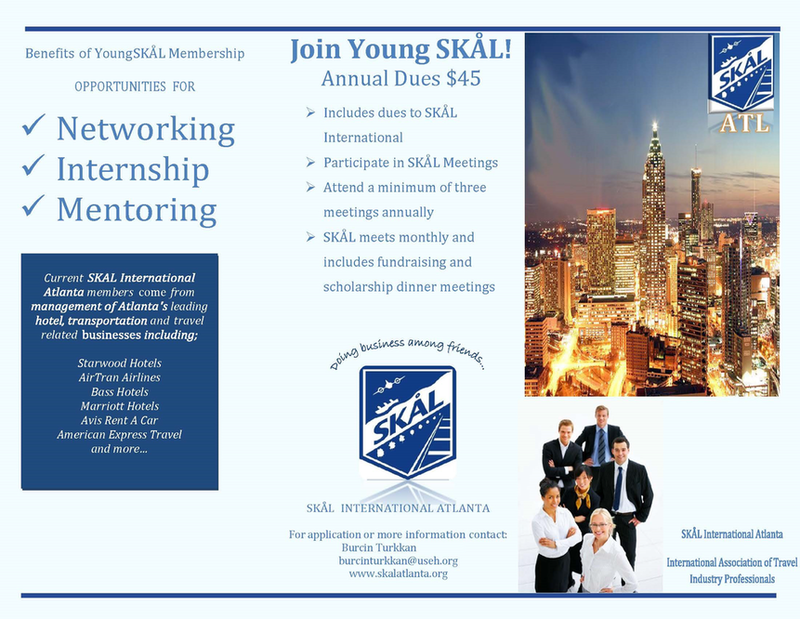 Young Skål members automatically have all the benefits of Active membership through the Skål International website. Clubs may transfer Young Skål members who qualify to Active membership at any time, once eligibility has been established. Young Skål members may attend Skål World Congresses availing themselves of possible special discounts at the discretion of the host Club. Young Skål members who leave the training institute and do not enter the industry or if employed depart from an industry position would cease to be eligible for membership. Skål Clubs should take care when selecting Young Skål members to ensure that the management intentions and potential are clearly evident to avoid situations whereby Young Skål members have to leave the Club at the age of 35 because they are not eligible for Active membership. Young Skål members should also be encouraged to use the “Member Get Member” approach to increase membership in their Club. SKAL Club of Atlanta Inc.
​DesignedbySamZ- Copyright © 2019 SKAL Club of Atlanta Inc.